Shell and Total, two of the world's largest oil-and-gas companies, both posted a sharp increase in second-quarter profits on Thursday as Big Oil's earnings season got underway. However, Shell's performance fell short of analysts' expectations, and its stock dipped in pre-market trading. Why it matters: The earnings reflect the strengthening of oil prices, which have been on a largely upward trend over the past two years, even as companies have sought to keep costs restrained. Shell said it's spreading the wealth to investors, announcing the launch of a $25 billion share buyback in 2018–2020. Shell's second quarter profit was $4.7 billion, up 30% from the same period last year. Go deeper: Via the Wall Street Journal, Shell Kicks Off Big Oil Earnings With Growth Spurt. The energy sector is bucking a corporate trend. Across all major industries, CEOs running S&P 500 companies cumulatively made $10 billion in 2017 — 44% higher than what is usually reported — when you factor in their actual total compensation, according to an Axios analysis of Securities and Exchange Commission filings. Yes, but: Many energy stocks did pretty poorly last year. So energy CEOs overall made less than what is normally reported because their stock grant values were higher than the amount of stock they actually cashed out, the analysis by Axios' Bob Herman shows. Check out the chart above, which shows the energy sector CEO pay data for energy companies in the S&P 500 based on whether it's higher or lower than what's usually reported. The details: Bob calculated what's known as the actual realized gains (ARG) of CEOs' stock options and awards — shares that were actually exercised and taxed — versus the estimated fair value (EFV) of their stock that predicts future stock value and is prominently featured in the summary compensation tables of SEC filings. The analysis covers total CEO compensation (salary, bonuses, stock, perks and pension/health benefits) based on 2017 proxy documents that companies file annually with the SEC. Overall, 59 energy and utility CEOs made $668 million based on our calculations — 13% lower than the $769 million that is normally shown in the traditional EFV format. The median energy/utility CEO pay package was $9.6 million. 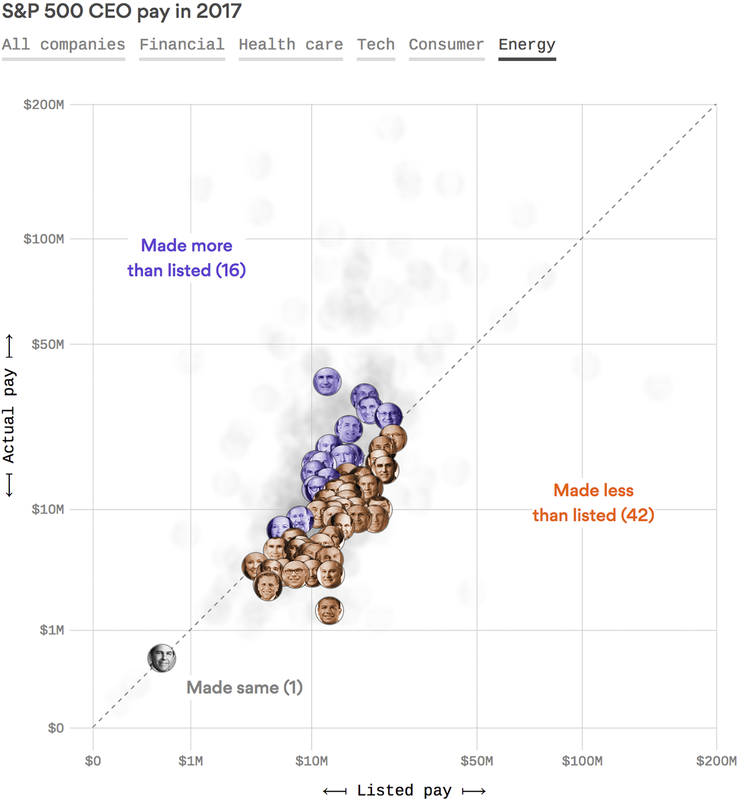 In contrast, CEOs in the tech, finance and health care industries often made a lot more in real dollars than what was normally reported, the Axios analysis shows. Read more on energy CEO pay in the Axios stream. Check out the interactive graphic and story on S&P500 CEOs. Explore the data yourself here. Driving the news: President Trump emerged from a trade-focused meeting with European Commission President Jean-Claude Juncker and said Europe will become a "massive" buyer of U.S. liquefied natural gas. Juncker, with Trump in the Rose Garden yesterday, said: "We’ve decided to strengthen our cooperation on energy. The EU will build more terminals to import liquefied natural gas from the U.S."
Reality check: Thus far, Asian countries and Mexico have been the main buyers of U.S. LNG as the industry has emerged in recent years, but there's room for growth in Europe as exports rise and new projects come online. But while boosting gas exports to Europe is a goal that dates back years, some analysts say there's reason to doubt that the continent will ever become a huge destination for U.S. cargoes, given its closer and less expensive options. The intrigue: However, LNG from the U.S. and elsewhere can still affect European energy markets and geopolitics. The growth of global LNG trade provides more supply options, giving Europe more commercial leverage with Russia, a huge supplier of gas, and helping to force Gazprom into concessions. What they're saying: "US LNG is competitive in Europe on the spot market when the price is low, as it is now. In the future it will be hard to compete with piped gas from Russia and closer sources of LNG," David Goldwyn, a former senior State Department energy official, tells Axios. "[A]s soon as the Russians get greedy, US LNG provides a ready substitute. US LNG has made the global gas market competitive. But it is unlikely we will export vast quantities of LNG to Europe unless the Russians overreach. If they do we will quickly take their market share," adds Goldwyn, now head of the consultancy Goldwyn Global Strategies. Go deeper: Trump and EU call trade war truce. National Grid's Mike Calviou writes for Axios Expert Voices ... New York and all six states in New England have aggressive, long-term, economy-wide CO2 emission reduction targets, with five having set a goal of reducing emissions 80% from 1990 levels by 2050. According to the most recent data, the Northeast has achieved a 16% economy-wide reduction from that benchmark. Yes, but: Despite this progress, the current rate of reductions is insufficient to meet the 2050 goals. To do so, northeastern states would have to triple the pace of gains made between 1990 and 2015. In order to meet interim goals by 2030, emissions would have to be reduced across the three dominant energy sectors that involve CO2 combustion: electricity generation, transportation and heat. The electricity sector would need to achieve a 67% zero-carbon electricity supply, as opposed to 45% today. In the transportation sector, the number of light-duty electric vehicles on northeast roads would need to reach more than 10 million (50% of all light-duty vehicles), compared with fewer than 75,000 today. In the heat sector, the rate of efficiency retrofits would need to double, and nearly 5 million oil-heated buildings would need to convert to electric heat pumps or natural gas. Address the highest-emitting fuels and sectors first. Optimize existing electric grids and gas networks. Avoid price shocks to the customer. Calviou is senior vice president of strategy and regulation at National Grid. Go deeper: Read National Grid's full report. State of the market: Per Reuters, "Brent crude prices rose on Thursday after Saudi Arabia suspended its oil shipments through a key Red Sea strait in response to an attack on two of its tankers and as data showed U.S. inventories fell to a 3-1/2 year low." Blockchain: Via Utility Dive, "Four utilities that serve New York — Avangrid, Con Edison, New York Power Authority and National Grid — announced a collaboration to discover and develop what they call "transformative" ways shared blockchain infrastructure could be used in the energy industry to benefit customers." Climate lobbying: In a newly posted Lobbying Disclosure Act filing, there's a list of Squire Patton Boggs lobbyists who may be working on behalf of the recently formed Americans for Carbon Dividends. My Axios colleague Amy Harder wrote about the group's launch here. "Next week's issue of The New York Times Magazine is an unusual one. It's dedicated to a single long story, by writer-at-large Nathaniel Rich, about the ten-year period from 1979 to 1989, the decisive decade when humanity settled the science of climate change and came surprisingly close to finding a solution." "The world was ready to act. But we failed to do what was necessary to avoid a catastrophe. Rich's story is a gripping narrative that reads like a historical whodunit." Intrigue: Axios' Dan Primack had an interesting piece yesterday on some questions swirling around fuel cell maker Bloom Energy's IPO.